A candid moment from Adas Emuno's Religious School's Israel Day program, captured by our photographic spy! At Adas Emuno, we approach religious education not just by talking, but also experientially, by doing! And by teaching that we can have fun while learning! 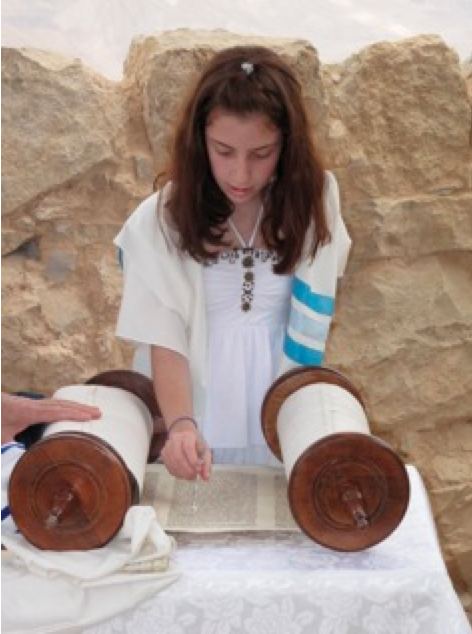 Mazel Tov to Congregation Adas Emuno's Melissa Noorily, her parents, Dr. Stuart Noorily and Marilyn Katz, and brother, Drew, on the occasion of her bat mitzvah! In Melissa's own words: "In April, I traveled to Israel for my Bat Mitzvah. I had my service on top of Masada, next to the oldest Synagogue. Some of the highlights of the trips were going to the Dead Sea, touring Jerusalem, visiting Yad Vashem and an Archelogical "Dig for a Day." 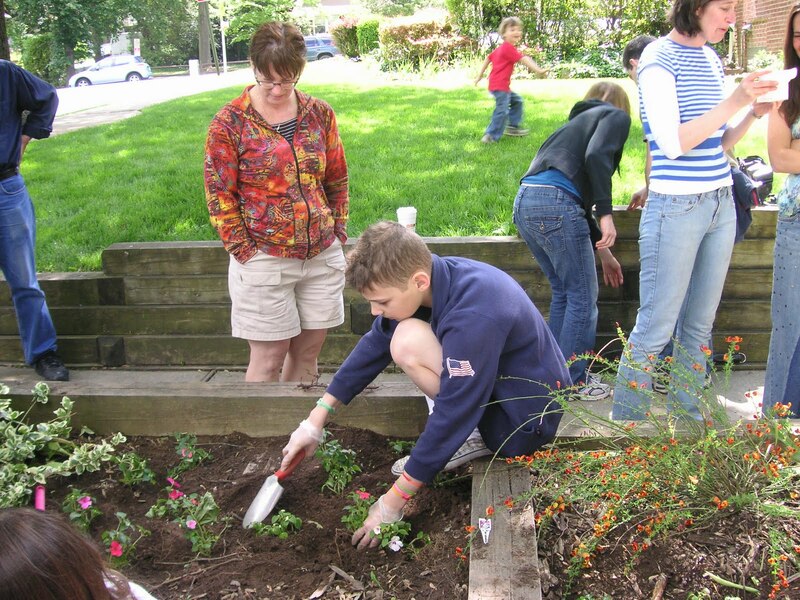 This year for my Bat Mitzvah project, I have volunteered weekly at the JCC Aftercare assisting teachers with toddlers." The students and families at Congregation Adas Emuno in Leonia were treated to a special Israel themed program on May 16th. 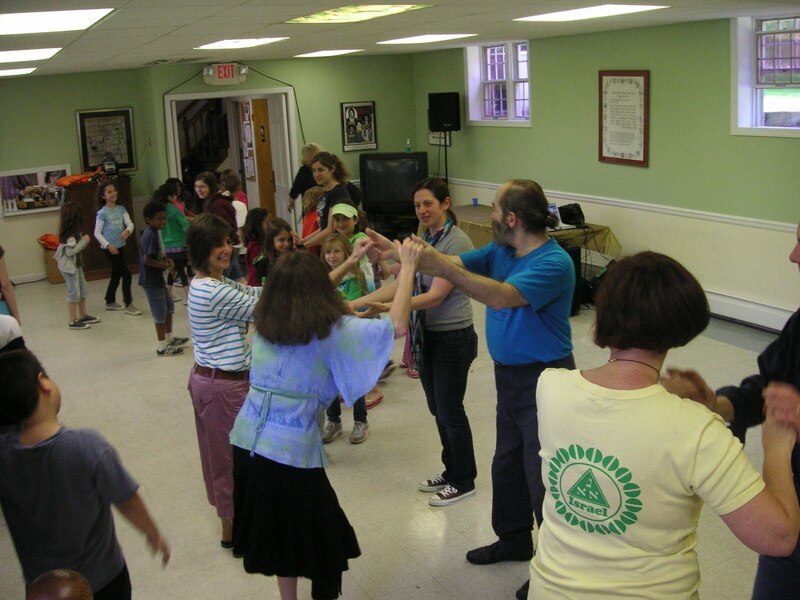 In addition to planting flowers, posting prayers on their own "Western Wall", and sampling delicious falafel, Adas Emuno was able to include Israeli folk dancing to their program. The dancing was led by instructors from the Israeli Dance Institute of Manhattan and made possible thanks to a generous grant from the Israel Programs Center of the UJA Federation of Northern New Jersey. As you can tell from the photograph, a wonderful time was had by all! Tomorrow is the last day of our religious school year, and we send our congratulations to all of our wonderful students for successfully completing their studies this year, and our sincere appreciation as well to our School Director, Jennifer Katz-Goldstein, and all of our dedicated, gifted teachers! What year is it? No doubt you'd answer, it's 2010, of course! And if I asked, what year is it on the Jewish calendar, well, you might have to go look it up (I know I had to check to make sure) before answering, 5770. As Jews living in a western society, we use the same calendar everybody else uses, and typically, we don't think twice about it. Many of us even use the designations BC and AD, even though the abbreviations have a religious meaning that does not reflect our faith. BC stands for Before Christ and AD for Anno Domini, which means In the Year of Our Lord. Since we don't believe in Jesus Christ, let alone consider him our lord, using BC and AD forces us to make a declaration that goes against our beliefs. From a traditional standpoint, that is a very serious matter indeed, although from a modern standpoint, we might use BC and AD without attaching very much significance to the terms. There is an alternative used by non-Christians, however, and I remember first encountering it when I was a child in religious school, in the Jewish history textbooks we were given. Instead of AD, we can use CE, which typically stands for Common Era, but also has been taken to mean Christian Era, and Current Era. And for BC we substitute, quite naturally, BCE, which stands for Before Common Era, or Before Christian Era, or Before Current Era. Actually, it's BCE that's the most useful of the two, as we typically do not use AD and therefore do not need to substitute it with CE. So, it's good that BCE so closely resembles BC, as that helps to avoid confusion among those not familiar with these alternate designations. Interestingly enough, the phrase "common era" was first used by Christians, although the formal substitution for BC and AD is traced back to 19th century Jewish scholars. But today, BCE and CE are used by members of other non-Christian faiths, by atheists, and even by some Christian denominations. For more on this, take a look at the Wikipedia entry on Common Era. White House Omits "in the Year of our Lord"
Placed in the context of a network that has consistently denounced perceived slights against Christianity as the result of political correctness and secularism run amok, the message is clear: Those godless Marxists are at it again. But if you click through the image, you discover a report about how the White House has not included the phrase "in the year of our Lord" in a proclamation... declaring May as Jewish American Heritage Month. Seriously, what is wrong with the people at Fox? How can they honestly have a problem with the White House removing that reference from a proclamation celebrating Americans who don't believe Jesus was divine? Is it actually their position that the White House should be actively seeking to insult the people they are trying to honor? Apparently, Fox has decided that America is a Christian Nation, and the rest of us are just visiting here. Mind you, we're not even talking about the use of AD here, but the actual use of the formal phrase, "In the Year of Our Lord"! And for a proclamation for Jewish American Heritage Month! Is it really possible that no one at Fox News sees the irony in this? What more can we say but, Oy Vey! When it comes to sensitivity on Fox News, you might say that it goes in one year and out the other! In order for our synagogues, our schools, and our community agencies to survive and thrive, Jews need to create a new covenant and organizational culture, grounded in relationship and mutual respect. When we genuinely relate to one another as beings created b’tzelem Elohim, from the Board president to the administrative assistant, our communal organizations will become gardens of creativity, prosperity and peace. We will celebrate each other’s successes and simchas. We will view intermarriage and conversion not with suspicion, but as an opportunity to welcome new members into our Jewish family. Our religious, cultural and relational diversity will be seen as a “value add,” rather than a threat to the fabric of Jewish life. “The way of the land;” thoughtful conduct and common decency toward others. According to midrash, derech eretz preceeds Torah (Leviticus Rabbah 9:3); perhaps one might say Torah rests on the foundation of derech eretz. Our individual and institutional conduct as a Jewish community rest on the foundation of derech eretz in visible, tangible ways. We actually live up to the ethics and values we allegedly espouse. We hold each other accountable to “walk our talk,” and we are as invested in the success of other organizations as we are in our own success. Our practices are transparent and we are fully and equally accountable to constituents, donors, funders and colleagues. We treat all of our colleagues with respect and dignity regardless of role, level of education, or economic privilege. Our respect for them is apparent in every encounter. Justice and compassion are two critical cornerstones of our community values, and are evident in all of our interactions and institutions. We are genuinely warm and welcoming to everyone who enters our institutions; evident in every human interaction on the phone, via email, or in person, from the Board President to the administrative assistant. Hospitality is not just an industry; it’s a spiritual practice. We extend ourselves to one another with kindness regardless of whether we have ever met before. We offer the same kindness we would want to receive. How many times have you heard someone say, “I don’t want to engage in lashon hara, but….,” and then launch right into gossiping about someone in the community?! Lashon ha’tov is more than just abstaining from gossip; it is also about the spirit and flavor of how we talk to one another. Lashon ha’tov is about listening and speaking from the heart. Closely related to kavod, lo levayesh means that we actively engage in behaviors that are expressly intended to comfort, delight, protect and honor someone else. Specifically, we don’t behave or speak in a manner that would embarrass others or ourselves. All Jewish communal professionals are compensated sufficiently, with salaries that allow them not only to meet their basic needs, but also to participate fully in the programs, culture, education and services of the Jewish community. This mitzvah appears more often than any other in the Torah. It’s about love, folks—expressing love for our neighbors, ourselves, the Other. We are not only polite to one another; we are actually loving, warm and generous of heart. We are just about to finish the season of counting the omer, a seven week period in the Jewish calendar where we reflect daily on middot, “soul traits” or character traits, to spiritually prepare ourselves for Shavuot. May this testimonial, and these guidelines, serve as a framework for introspection, discussion and renewed commitment to a Jewish community that reflects the spirit of liberation and revelation. K’eyn yehi ratzon– May it be so. To which we can add our own hearty, Amen!